This page was devoted solely to keeping up-to-date information on a beer that Tom Baker of Heavyweight Brewing graciously allowed me to be guest brewer on, at the amazing, late lamented Heavyweight brewery. Since the beer is no longer being made it is not likely to be updated much more often. Update: a batch was made at 508 Gastrobrewery, a collaboration with Chris Cuzme, in the fall of 2014. This page last updated April 8, 2015 4:58 PM . To see last update for individual draft lists, check What's New Page. 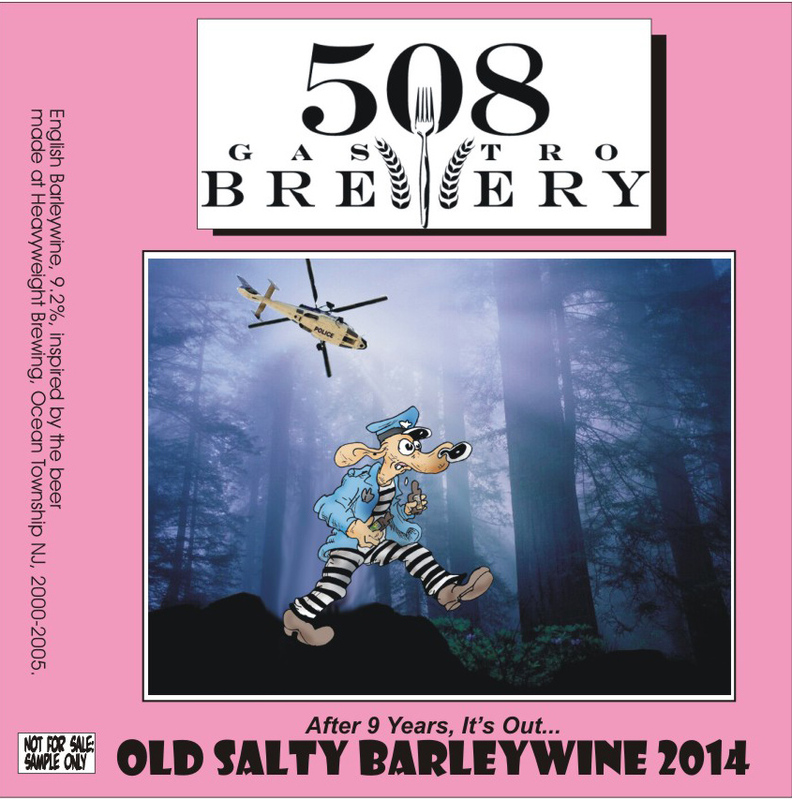 4/8/15: 2014 Old Salty from 508 Gastrobrewery once again appears at Mugs Alehouse. I believe this is the last keg of this beer left. 2/28/15: Old Salty makes a triumphant return to Mugs Alehouse's Split Thy Brooklyn Skull after a gap of many years. 12/14/14: At the Blind Tiger Event "Bill & Tom's Excellent Adventure," at which Bill Covaleski of Victory of Tom Baker formerly creator of Heavyweight and cobrewer of Old Salty, now of Earth, Bread and Beer, a keg of the 508 Gastrobrewery Old Salty was put up as a nice tribute to Tom's past. 12/3/14: After a gap of nearly 9 years since its last brewing, Old Salty escapes to 508 Gastrobrewery, as a new batch brewed with Chris Cuzme appears at the pub. 2/7/07: A 2005 Bourbon barrel is going up at Collins as part of their "Heavy Hearts for Heavyweight" festival. 2/3/07: A 2005 Bourbon barrel (their last) is tapped at Barcade. 5/24/06: Old Salty continues at Hop Devil and is also appearing at dba and Grey Lodge. 5/16/2005: Old Salty Bourbon keg is up at Hop Devil. 5/1/2005: Old Salty Bourbon Cask is up at Barcade. 9/22/05: One of the few casks left of Old Salty 2004 just went up at Max's on Broadway in Baltimore. 9/12/05: Old Salty 2004 in bottles at Levee and Andys' Corner Bar. 7/23/05: Old Salty 2004 will be on draft, as well as various vintages of bottles, as part of Heayweight night at Spuyten Duyvil. 7/20:05: Old Salty 2002 (!!!) is on draft at Blind Tiger tonight, as part of their Christmas in July Event. 5/20/05-5/21/05: Brewed first batch of Old Salty 2005 at Heavweight. 2/18/05: As part of their BRRCade frozen beer festival, Barcade is putting up a tap of frozen, Bourbon-barrel Old Salty 2004-first keg ever! 2/10/05: Old Salty is still on draft at Waterfront (Manhattan), and a cask went up at Blind Tiger last night, as part of their barleywine fest. 1/8/05: A keg of the regular Old Salty was on tap at Barcade. 12/30/04 A Keg of Old Salty was up on draft at Waterfront (Manhattan). 12/18/04: Another keg of Old Salty "bourbon barrel" was put on tap at Barcade for their Winter Beer Fest. 12/1/04: A keg of Old Salty that was aged in a bourbon barrel was put on tap at Blind Tiger for their Hoiliday Festival. Note: some of this was bottled, also!!! 11/18/04: Wow, it's been a while since I updated this page! Anyway, there is a new keg of 2004 Old Salty at Barcade. 3/29/04: Oak-Aged 2003 Old Salty at Spuyten Duyvil. And the Matchless keg is still up...that means 2 kegs are up in a ten minute walk from my house, two different vintages! Life is good! 3/19/04: On draft at Matchless is 2002 Old Salty! 1/14/04: At Heavyweight Bout III at Blind Tiger, Wood-aged Old Salty will debut for this year. Also on the current draft list on the website Andy's Corner Bar, a caks of Old Salty is listed int the "Coming Soon" section. 12/11/03: per their current draft list, Old Salty is still up at Blind Tiger. 11/28/03: Matured Old Salty 2003 is appearing in several area bars, including Blind Tiger. 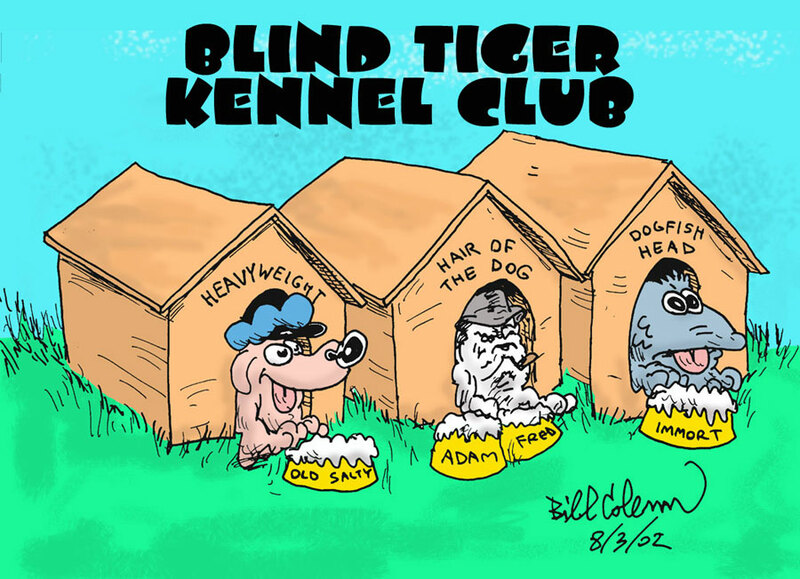 8/13/03: Old Salty 2003 will be making it's world premiere at Blind Tiger for the Dog Days of Summer II Event. 7/16/03: A special wood-aged cask of Old Salty will be served at Blind Tiger for their Christmas in July event. 5/9-10/03: Old Salty 2003 was brewed at Heavyweight. Read an account on their website here. Also, at the end of the brew session, we returned to Helmers and were happy to see another keg of Old Salty there. 3/26/03: This night, Old Salty 2002 was put on draft at Blind Tiger. 3/18/03: Old Salty 2002 sighted at Helmers. 2/21-23/03: I have it on good authority that 2 different vintages of Old Salty will appear this weekend at the Real Ale Festival at the Brazen Head. See Calendar for details. 1/15/03: Heavweight Vintage Bout II, The Blind Tiger Ale House, 6:00 p.m. onwards, 518 Hudson Street (on the corner of West 10th St.). Telephone: (212) 675-3848.2002. The second annual…featuring new, old, always bold Heavyweight Brewing & Tom Baker tasty classic concoctions, including, on draught, three different years of Old Salty (! ), aged Lunacy, the very last keg of Stickenjab 2002, Hammered Druid, casks of Perkuno’s Hammer and Cinderbock, bottles of Biere D’Art (to be added to the Blind Tiger’s regular bottled beer list) and perhaps even more…! All this plus cheese and an appearance by the large dwarf himself! 11/23-24/02: On one of these dates, a keg of Old Salty 2002 will be served at the White Horse Old Ale Festival, London, UK. For info on the festival, check out the white horse page at http://www.whitehorsesw6.com/. 11/20/02: Heaviest of Heavyweight, Andy's Corner Bar, 265 Queen Anne Road, Bogota, NJ. Tel: (201) 342-9887. A vertical tasting of the last three years of Old Salty Barleywine. This night is not for the faint of heart or any lightweights. 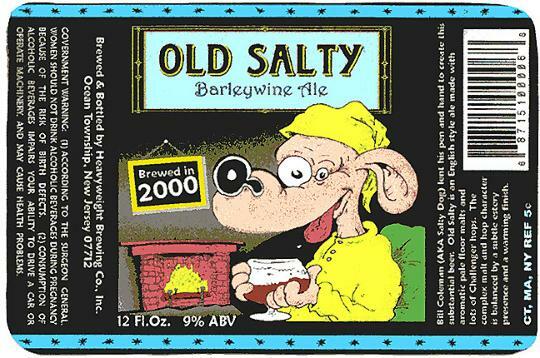 8/7/02: A cask of Old Salty 2000 will appear at Dog Day Afternoon, Blind Tiger. 6/17/02: At the B'Eire d'Art premier tonight at Andy's Corner Bar, a mini-keg of Old Salty will be served, along with some other fine Heavyweight beers. 05/15/02: Appearing at the Blind Tiger. this Wednesday will be "Young Old Salty," a preview of the Winter 2002 batch, in a wooden pin prime with Lyle's Golden Syrup. 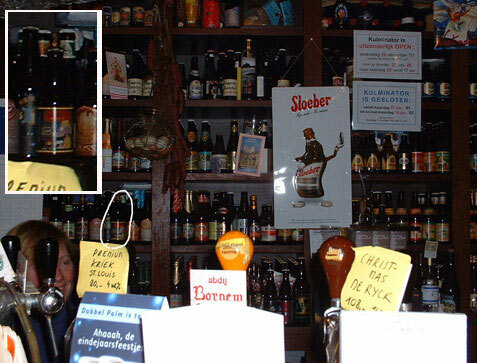 05/13/02: At left you can see a bottle of Old Salty 2000 making an appearance in the wall of bottles at the Kulminator in Antwerp, quite possibly the best beer bar in the entire world! I dropped this bottle off in October of 2001, and it great to see that it is aging in great company. I have inserted a blow up to make it a little more clear. Many thanks to Chuck Cook for this photo. 04/26-27/02: Back at Heavyweight this weekend, making batch #2 of Old Salty 2002 with Tom Baker. Afterwards, we went to the Blind Tiger, which currently has a keg up of Old Salty 2000! 3/17/02: Old Salty is appearing at The Gate. 03/15-16/02: I was at Heavyweight this weekend brewing Old Salty 2002 with Tom Baker and Warren Becker (batch #1, a second will follow in a few weeks. After brew day on Saturday, we went to Helmers, and were happy to see that Old Salty was still up there. 03/9/02: A special keg of wood-aged Cold Salty appears at the Split Thy Brooklyn Skull at Mugs Ale House. 02/06/02: Old Salty (a very special keg) will appear at the Barleywine tasting at the Blind Tiger. 02/02/02: Old Salty 2001 sighted at Helmers. 01/16/02: Old Salty 2000 will appear at the Heavyweight Vintage Beer Festival at the Blind Tiger. 01/09/02: Old Salty is still on draft at Blind Tiger. 12/15/01: Old Salty 2001 is now on draft at Blind Tiger. 12/12/01: Old Salty is now on draft at Mugs Ale House. 12/05/01: Old Salty 2001 is now on draft at Sparky's, and has been for a couple of days! As a matter of fact, last saturday they had both 2000 and 2001 up briefly, and I missed it! Drat! 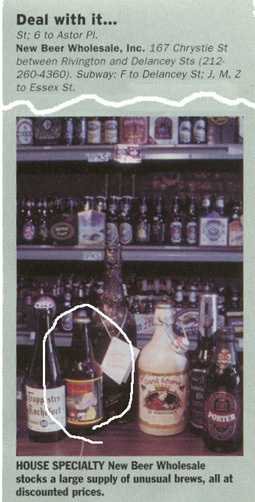 12/02/01: Old Salty 2001 bottles are now appearing at Thrifty beverage and many other retailers. The draft version will follow later this month. 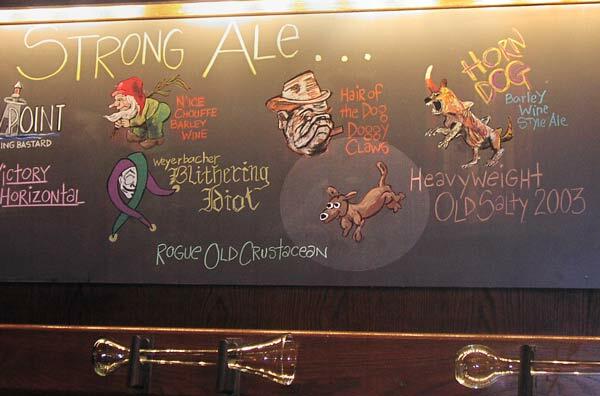 In addition, a cask of 2000 is presently appearing at Andy's Corner Bar. 11/17/01: Old Salty 2000 is at Sparky's, and nicely aged it is, too! 7/27/01 (hey, it's been a while! ): At left, you will see a page from the current issue of Time Out magazine (July 26-August 2, 2001, Issue Number 305). In this special "Cheap!" issue, the excellent New Beer Wholesale, Inc. store is highlighted as a good place to go for very good beers at very good prices, which it certainly is! Please note one of the "unusual" beers that was chosen to illlustrate the recommendation! Also, please note that on Friday, June 27, a keg of Old Salty is scheduled to hit the bar at Blind Tiger. 5/07/01: An account of the brewing of the 2001 batch of Old Salty has been put up on the Heavyweight Website. 5/2/01: Heavyweight "Launch Party" at Blind Tiger on this night. There will be a wooden cask of Old Salty there among many other unique, rare beers. 4/20-21/01: On these dates, the second, 2001, batch of Old Salty was brewed, which will be aged substantially before release in the winter. 4/14/01: Old Salty appeared at the Philadelphia Split Thy Skull Barleywine Festival at Sugar Mom's. 3/2/01: Went to Helmers and was happy to see the Old Salty was still on tap. 2/19/01: There is an illustrated page on the Split Thy Skull tapping at the Heavyweight website. 2/17/01: On this date, the Split Thy Brooklyn Skull Barleywine festival at Mugs Ale House featured the world premiere of a special version Old Salty aged in a wooden firkin that originally housed first whiskey, and then J.W.Lee's Harvest Ale. 2/07/01: Just recieved word from Tom Baker that Helmers has a keg of Old Salty up now. 2/02/01: Went to Sparky's last night. They had a great selection, as usual, including a grand total of 4, count 'em 4, Heavyweight beers, including casks of both Old Salty and Perkuno's hammer! My first taste of Old Salty from the cask was quite good, if I do say so myself! 1/28/01: Stopped in at Mugs Ale House and found Old Salty on tap, as well as checked out the new bottle cases behind the bar! 1/25/01: An update on the 1/23 entry. Old Salty went on tap at The Blind Tiger today! 1/24/01: At Andy's Corner Bar tonight, they were serving Salty Hammer, a unique blend (in the keg) of Old Salty and Perkuno's Hammer. Also, I was informed by Tom Baker earlier in the day that Sparky's has a cask of Old Salty that they will be serving next week. 1/23/01: I have just been informed by The Blind Tiger that Old Salty will be going up again in either Wednesday (1/24) or Thursday (1/25). 1/19/01: At the Khyber Pass, in Philadelphia, PA, there will be a Heavyweight event, featuring several beers on draft, and Old Salty in bottles. 1/18/01: Per their website, Old Salty is definitely on tap at Andy's Corner Bar. 1/10/01: At Mugs Ale House, the monthly meeting of the Malted Barley Appreciation Society will host Tom Baker, Heavyweight Brewer, and a tasting of Old Salty. Also on the same day, I found that The Blind Tiger has another keg of Old Salty, as well as many other Heavyweight brews. They should have it up on tap in about a week. 1/7/01: Andy's Corner Bar will have a keg of Old Salty this evening...I have it on good authority! 1/1/01: In the NYC, area, The Blind Tiger put the beer up, in a new keg. I believe by today, 1/7/00, it has probably been tapped out, but they will put up another soon.